B29 - Boeing B-29 "Superfortress"
The Boeing B-29 was designed in 1940 as an eventual replacement for the B-17 and B-24. The first one built made its maiden flight on Sept. 21, 1942. In December 1943, it was decided not to use the B-29 in the European Theater, thereby permitting the airplane to be sent to the Pacific area where its great range made it particularly suited for the long over water flight required to attack the Japanese homeland from bases in China. During the last two months of 1944, B-29s began operating against Japan from the islands of Saipan, Guam and Tinian. This was an extremely costly scheme, as there was no overland connection available between India and China, and all the supplies had to be flown over the Himalayas. B-29s started to arrive in India in early April 1944. 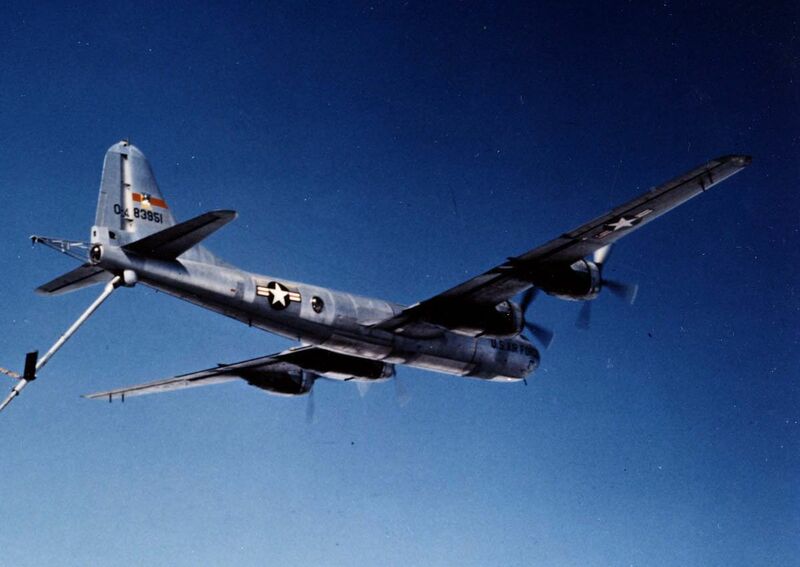 The first B-29 flight to airfields in China (over the Himalayas, or "The Hump") took place on 24 April 1944. The first B-29 combat mission was flown on 5 June 1944, with 77 out of 98 B-29s launched from India bombing the railroad shops in Bangkok (Five B-29s were lost to non-combat causes). On 15 June 1944, 47 B-29s launched from Chengdu, China, bombed the Imperial Iron and Steel Works at Yawata, Japan. This was the first attack on Japanese islands since the Doolittle raid in April 1942. The first B29 combat loss occurred during this raid, with one B-29 destroyed on the ground by Japanese fighters after an emergency landing. Because of the extreme cost of operations, the raids against Japan from Chinese airfields continued at relatively low intensity. Japan was bombed on: 7 July 1944 (14 B-29s), 29 July (70+), 10 August (24), 20 August (61), 8 September (90), 26 September (83), 25 October (59), 12 November (29), 21 November (61), 19 December (36) and for the last time on 6 January 1945 (49). B-29s were withdrawn from airfields in China by the end of January 1945. Throughout this period B-29 raids were also launched from China and India against many other targets throughout Southeast Asia. However, the entire B-29 effort was gradually shifted to the new bases in the Marianas, with the last B-29 combat mission from India flown on 29 March 1945. The need to use inconvenient bases in China for attacks against Japan ceased after the capture of the Marianas islands in 1944. On the islands of Tinian, Saipan and Guam five major airfields, each constructed as a base for a four-group wing of B-29s, became the launch sites for the large B29 raids against Japan in the final year of the war. The islands could be easily supplied by ship. The first B-29 arrived on Saipan on 12 October 1944, and the first combat mission was launched from there on 28 October 1944, with 14 B-29s attacking the Truk atoll. The first mission against Japan from bases in the Marianas was flown on 24 November 1944, with 111 B-29s sent to attack Tokyo. 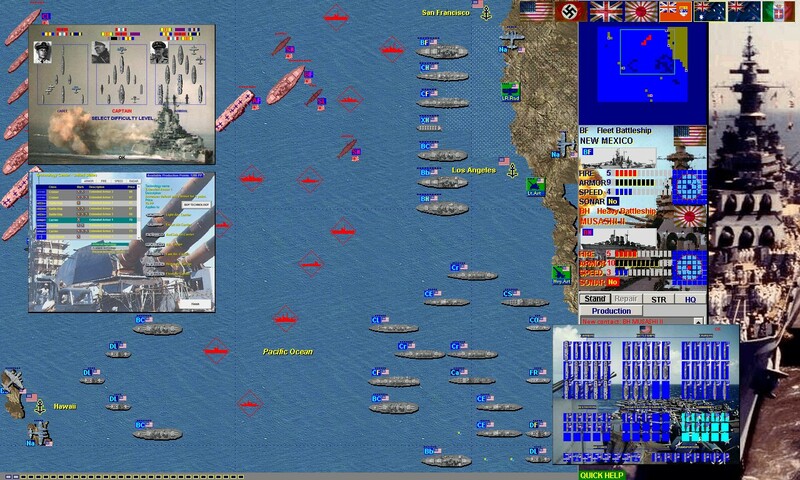 From that point, ever more intense raids were launched regularly until the end of the war. These attacks succeeded in devastating all large Japanese cities (with the exception of Kyoto) and gravely damaged Japan's war industries. Although less appreciated, the aerial mining program carried out by B-29s against Japanese shipping routes and harbor approaches had profoundly degraded Japan's ability to support its population and fight the war. Perhaps the most famous B29 is the Enola Gay, which dropped the atomic bomb 'Little Boy' on Hiroshima on 6 August 1945. Bockscar, another B-29, dropped 'Fat Man' on Nagasaki three days later. These two actions brought the Japanese to surrender and the official end of World War II. Both aircraft were handpicked for modification from the assembly line at the Omaha plant that was to become Offutt Air Force Base. Following the surrender of Japan, VJ Day, B-29s were also used to supply American POWs with food and other supplies by dropping barrels of rations on Japanese camps. Although considered for other theatres, and briefly evaluated in England, the B-29 was predominantly used in World War II in the Pacific Theatre. (The use of YB-29-BW 41-36393, the so-named Hobo Queen, one of the service test aircraft flown to RAF Bovingdon Airfield, was thought to be as a "disinformation" program intended to deceive the Germans into believing that the B-29 would be deployed to Europe.) The Hobo Queen even seems to have been featured in a photo in the Nazi newspaper V?lkischer Beobachter-the German newspaper's headline showing the photo of the Hobo Queen soon appeared in Boeing factory posters of the era. The Boeing B29 Superfortress variants is an extensive list of all the experimental and production models that Boeing made and the specific unique elements of each variant and/or design stage of the B29 Superfortress heavy bomber. The X B-29, Boeing Model 345, was the first accepted prototype or experimental model delivered to the Army Air Corps, incorporating a number of improvements on the design originally submitted, including more and larger guns and self-sealing fuel tanks. Two aircraft were ordered in 1940 August, and a third was ordered in December. A mock-up was completed in the spring of 1941, and it first flew on September 21 1942. The YB-29 was an improved XB-29 and 14 were built for service testing. Testing began in the summer of 1943, and dozens of modifications were made to the planes. The engines were upgraded from Wright R-3350-13s to R-3350-21s. Where the XB-29 had three-bladed props, the Y B29 had four-bladed. Various alternatives to the remote-sighted defensive systems were tested on a number of them, particularly the fourth one delivered. After alternative arrangements had been fully tested, defensive armament was standardised at five .50-calibre machine guns in turret-mounted pairs. The YB-29 also featured a better fire control system. The B-29 was the original production version of the Superfortress. Since the new bomber was urgently needed, the production design was developed in tandem with the service testing. In fact, the first B29 was completed only two months after the delivery of the first YB-29. 46 B-29's of this variant built by the Glenn L. Martin Company at its Omaha plant were used as the aircraft for the atomic bomb missions, modified to Silverplate specifications. 2,513 B-29's were manufactured by Boeing-Wichita (1,620), Bell-Atlanta (357), and Martin-Omaha (536). The B-29A was an improved version of the original B29 production model. All 1,119 B-29A's were built exclusively at the Boeing plant in Renton, Washington, formerly used by the United States Navy. Enhancements made in the B-29A included a better wing design and defensive modifications. Due to a demonstrated weakness to head-on fighter attacks, the number of machine guns in the forward dorsal turrets was doubled to four. Where the wings of previous models had been made by the sub-assembly of two sections, the B-29A began the trend of using three. This made construction easier, and increased the strength of the airframe. The B-29A was produced until May 1946, when the last aircraft was completed. It was much used during the Korean War, but was quickly phased out when the jet bomber became operational. Washington B Mk 1 - This designation was given to 88 B-29As supplied to the Royal Air Force. The B-29B was a modification used for low-level raids, designed with the intent of firebombing Japan. Since fighter opposition was minimal over Japan in late 1944, many of the Army Air Force leadership  most notably Curtis LeMay, commander of the 21st Bomber Command  felt that a (lighter) faster bomber would better evade Japanese flak. In the B29 B, all defensive armament was removed, except the M2 cannon in the tail, which was replaced by two automatically fired .50 in M2 machine guns. The weight saved by removing the gun system increased the top speed from 357 mph to 364 mph (574 km/h to 586 km/h). All 311 B-29Bs were built at the Bell plant in Marietta, Georgia ("Bell-Atlanta"). Never built, the B-29C was a modification of the B-29A re-engined with improved Wright R-3350 engines. The Army Air Force originally ordered 5,000, but cancelled its request when World War II ended. None were built. The B29 D was an improved version of the original B-29 design, featuring Pratt & Whitney R-4360-35 engines of 3500 hp (2600 kW) each  nearly 60% more powerful than the Wright R-3350. It also had a taller vertical stabiliser and a strengthened wing. The XB-44 was the testbed designation for the D model. When World War II ended, drastic cutbacks were made in military spending, altering the outlook of the B-29 programme. Because Congress was reluctant to continue funding wartime projects, the B-29D was redesignated B-50 to make it appear completely new. Congress fell for the trick, and the B-29D was kept alive, even though no planes flew under the original designation. A number of B-29s were converted to serve as test beds for new systems. These all received variant designation, even though many existed only as a single converted aircraft. 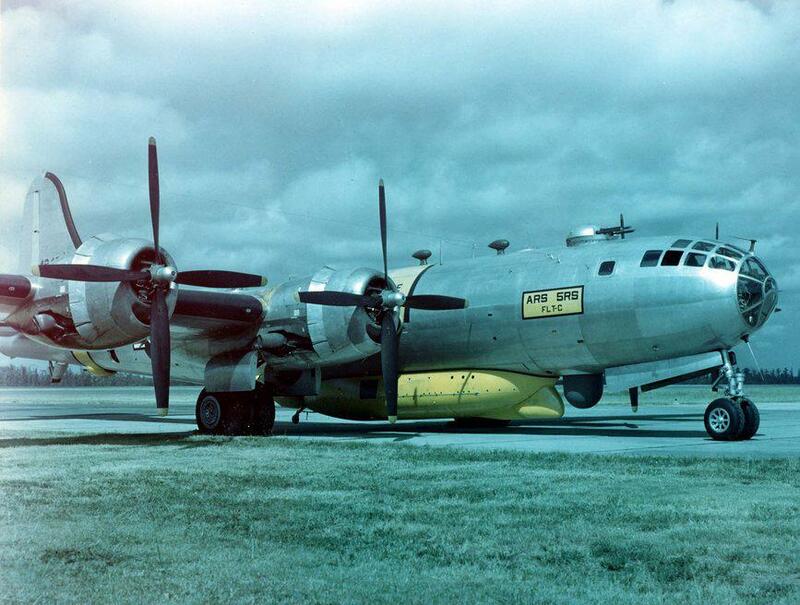 The X B29 E for fire-control systems (one converted) was a model B-29-45-BW. The B29 F for cold-weather operation in Alaska wer six converted B-29-BWs. It was also used in the development of jet engines. Stripped of armament, a converted B-29B- 55-BA (44-24043)(Bell) designated the XB-29G carried experimental jet engines in its bomb bay, which it would extend into the airstream for testing during flight. This plane was used to test the Allison J35, General Electric J47 and J73 jet engines. The XB-29H to test armament configurations was a converted B-29A. Experimentation in engines continued. 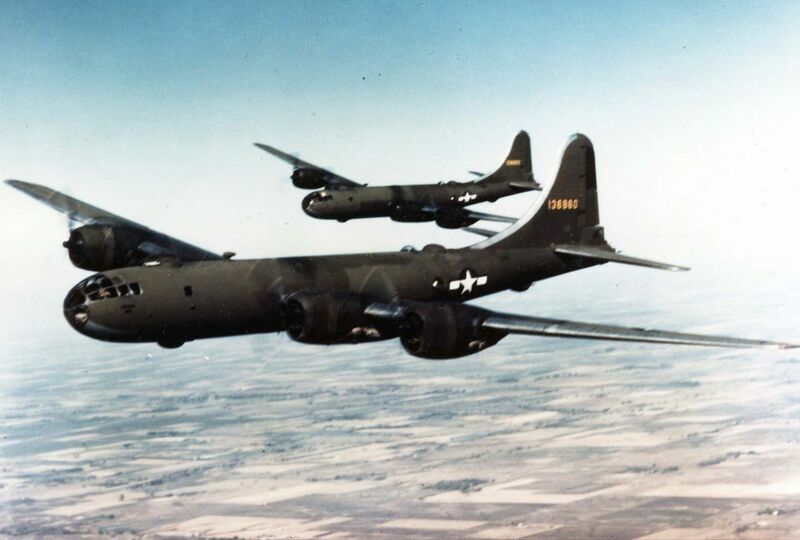 For example, six B-29s (redesignated YB-29J) of various designation were upgraded to B29 R-3350-79 engines. Other engine-associated items were also upgraded, including new Curtiss propellers, and 'Andy Gump' cowlings, in which the oil coolers have separate air intakes. Two were later converted to aerial refueling tanker prototypes, and redesignated YKB-29J. The remainder were used for reconnaissance, and designated RB-29J. The E B29 (E stands for exempt), was used as a carrier aircraft in which the bomb bay was modified to accept and launch experimental aircraft. They were converted in the years following World War II. One EB-29 was converted to carry the famous Bell X-1 until it was replaced by a B-50. Another was used to carry and test the XF-85 'parasite fighter'. This fighter was intended to be carried by the Convair B-36 on long-range missions to protect it from Soviet fighters. Yet another E B29 was used to carry two EF-84B Thunderjet fighters as part of Project Tom-Tom. All three Tom-Tom aircraft and their crews were lost in a crash on April 24, 1953. Six B-29A/F-13As were modified with the Wright 3350-CA-2 fuel injected engines and designated at YB-29Js. These were then converted to RB-29Js. In January 1949, R B29 were assigned to the 91st Strategic Reconnaissance Wing and moved to Yokota AB, Japan in December 1950; to provide support to the Korean Conflict and attached to the 15th Air Force, Far East Air Forces. The S B-29 'Super Dumbo' was a version of the B29 adapted for air rescue duty after World War II. Sixteen 29s were modified to carry a droppable A-3 lifeboat under the fuselage, the SB-29 was used mainly as rescue support for air units that flew long distances over water. With the exception of the forward lower gun turret, all defensive armament was retained. They also carried a variety of radio equipment, provisions, survival kits, and extra crew. It was used throughout the Korean War into the mid-1950s. It received its nickname from 'Dumbo', the name given by B29 pilots to the rescue planes who picked them up when they crashed at sea. The TB-29 was a trainer conversion of B-29 used to train crew for bombing missions; some were also used to tow targets, and the designation included B-29s modified solely for that purpose. Their most important role was serving as radar targets in the 1950s when the United States Air Force was developing intercept tactics for its fighters. The W B-29 were production aircraft modified to perform weather monitoring missions. They conducted standard data-gathering flights, including from the UK over the Atlantic, but were also ordered to fly into the eye of a hurricane or typhoon to gather information. Following nuclear weapons tests, some W B29 s would use air sampling scoops to test radiation levels. A Soviet-built copy of B-29, Tu-4, was used as the platform for a Chinese experimental airborne early warning aircraft, KJ-1 AEWC, in 1970s. The Navy acquired four B-29-BWs, March 14, 1947, for long-range patrol missions and given the designation P2B-1S with Navy Bureau numbers, BuNo's 84028-84031. P2B, BuNo 84029, went through modification to carry the Douglas D-558 Skyrocket high-speed rocket-powered research aircraft. Modifications of the bomb bay was done to carry the Skyrocket II under the belly and dropped for Mach speed testing. The first Skyrocket test flight occurred on September 8, 1950 with test pilot William B. Bridgeman, and George Jansen flying the B-29. Scott Crossfield broke Mach 2 on November 20, 1953; with the last Skyrocket flight in December of 1956. The XB-39 Superfortress was a single YB-29 modified to use water-cooled Allison V-3420-17 inline engines. Since the Army Air Force was concerned that problems might develop with their first choice of engine, the Wright R-3350, they contracted General Motors to do testing on a modified aircraft to show that it could still be used even if the R-3350 failed. Since the R-3350 did not have significant enough problems to prevent its use, no B-39s were ordered. In 1945, three B-29s were forced to land in Soviet territory after a bombing raid on Japan because of a lack of fuel. Since the Soviet Union was not at war with Japan at the time, the aircraft and crews were interned. Eventually, the B-29 crew members were returned, but the aircraft remained in Russian hands. Seeking a modern long-range bomber, Joseph Stalin ordered the Tupolev OKB to reverse-engineer the Superfortress. The resulting aircraft first flew in May 19, 1947 and immediately began series production. Although largely identical in appearance to American B29 the Tu-4(Nato reporting name: "Bull"), had Soviet-designed defensive guns and had been re-engineered to suit production using metric tools; resulting in an aircraft that was slightly heavier and slower than the B-29. The Tu-4 presented a significant leap forward in Soviet strategic bombing. Not only did the Red Air Force have the means to deliver nuclear weapons, but Tu-4 had sufficient range to reach the United States on a one-way trip. On October 18, 1951, a Tu-4 was used in the first air-drop test of a Soviet atomic bomb. In Soviet service, the Tu-4 had been phased out of service by the early 1960s, being replaced by more modern aircraft such as the Tupolev Tu-95. Although the "Bull" never dropped a bomb in anger, the Tu-4 influenced Soviet aircraft technology, particularly airframe construction and onboard systems. The People's Liberation Army Air Force of China is rumoured to still operate up to 15 upgraded Tu-4s, possibly as AWACS platforms. Advanced transport and bomber variants of the Tu-4 design such as the Tu-70, 75, 80, and 85, were developed and built, but none of these achieved serial production.